How to permanently delete files? How to destroy hard drive data permanently? How to wipe a hard drive with ease? This post shows you different ways to wipe a hard drive so as to permanently destroy the data on a hard drive. It's common to most of us to sell or give away computer or hard drive when they want to dispose of old device or upgrade to new ones. You may have already formatted the hard drive or deleted files on it in order to erase sensitive personal data and avoid becoming the victim of identity theft. The fact is that wiping out a hard drive is not as easy as deleting data or formatting hard disk. Simply deleting files by Shift + Delete or emptying the Recycle Bin does not permanently clear data, as deleted files can easily be recovered by recovery software. Is there any way to destroy data permanently or erase a hard drive? Of course, the answer is positive and I will show you how to wipe a hard drive or how to permanently delete files with three ways. Before wiping a hard drive, you can choose to back up the important files with the professional backup software – MiniTool ShadowMaker since the files can’t be recovered once the wipe action is performed. In order to erase data permanently, you can use a piece of data eraser software. 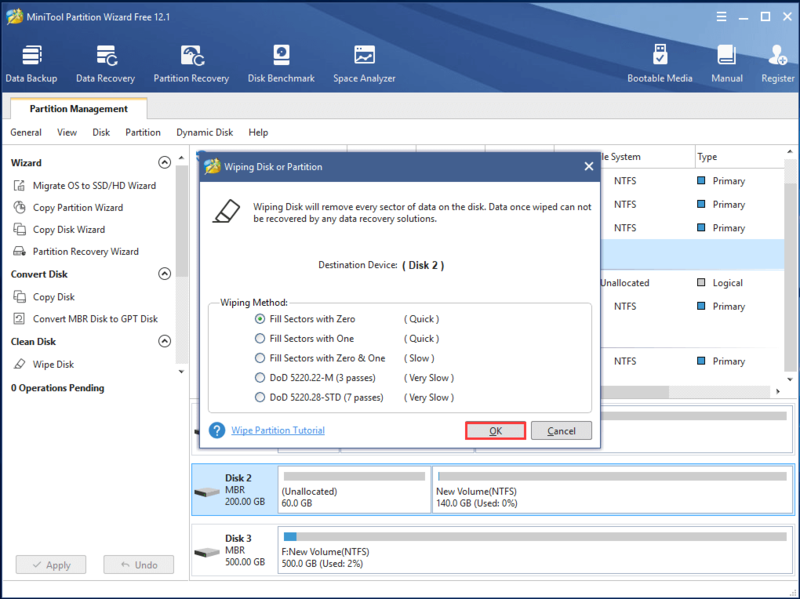 MiniTool Partition Wizard is strongly recommended. It is partition magic, focusing on dealing with various disk and partition matters. So in order to erase data permanently, its Wipe Disk feature plays an important role. Iwill show you how to wipe a hard drive Windows 10 with this data eraser software step by step with pictures. Step 1: Install the data eraser software and launch it to enter its main interface. Step 2: Choose the hard drive you want to erase and choose Wipe Disk from the context menu to continue. Step 2: In the popup window, you are required to choose a wipe method and click OK to continue. The more time wiping process takes, the higher security it enjoys. Step 3: Then you can preview the hard drive has become unallocated and click Apply to confirm the changes. When all steps are finished, you can find that the hard drive has been erased and all files on the hard drive have been deleted permanently. In order to wipe a hard drive, you can perform a full format in Disk Management with the hard drive eraser. Step 1: Press Windows key and R key together to open Run dialog and type diskmgmt.msc in the box and hit Enter to continue. 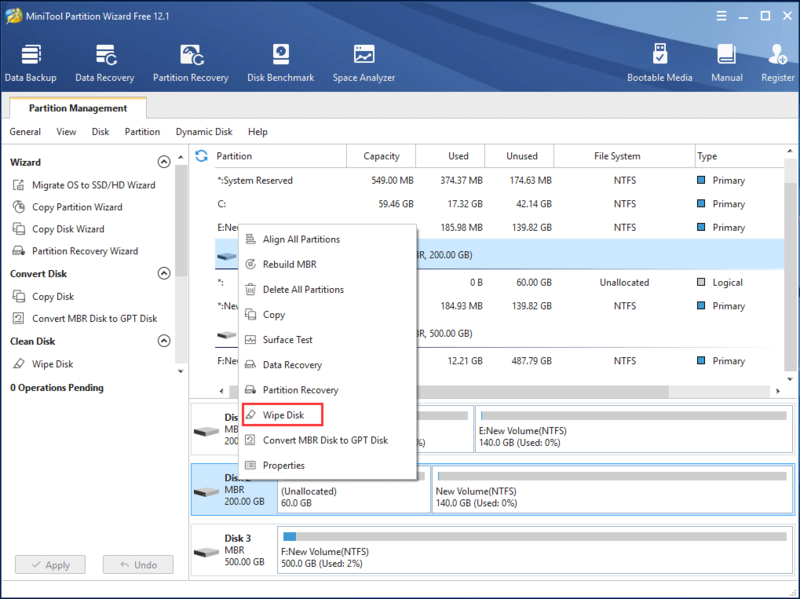 Step 2: In the Disk Management window, choose the hard drive you want to wipe and click Format from the context menu to continue. Step 3: In the popup window, uncheck Perform a quick format to perform a full format and click OK to continue. Step 4: Then you will receive a warning message which tells you that the formatting the hard drive will erase all data on this hard drive. And click OKto continue. When the process is finished, you have erased the hard drive. Step 1: Type Command Prompt in the search box of Windows 10 and right-click it to choose Run as administrator to continue. Step 2: Type diskpart in the command line window and hit Enter to continue. Step 3: Next, type list disk and hit Enter to continue. Step 4: Then you can see all disks are listed here. And select a disk which you want to erase by inputting the command select disk 1. Please note disk 1 just as an example and you can change it based on your own needs. Step 5: Then type the command clean all and hit Enter to continue. When you have finished all the above steps, you can finish the process of wiping a hard drive so as to delete all files permanently. Most of us choose these methods to destroy data permanently. But the data can be actually recovered by some third-party data recovery software.